Looking for the perfect gift for the person who has it all? 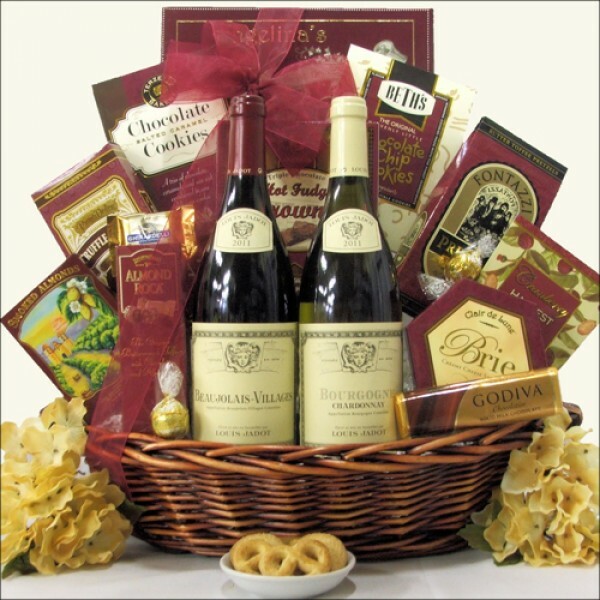 Send them this Jadot Duet wine and gourmet food gift basket. They will love the elegant look of the Louis Jadot Macon Villages Chardonnay White Wine and the Louis Jadot Beaujolais-Villages Red Wine, and will truly enjoy the wonderful tastes of the gourmet foods. The gift basket features California Smoked Almonds, Fontazzi Butter Toffee Pretzels, Ghirardelli Milk Chocolate Caramel Premium Squares, Godiva Milk Chocolate Chocoiste Bar and so much more. A great gift for any occasion.